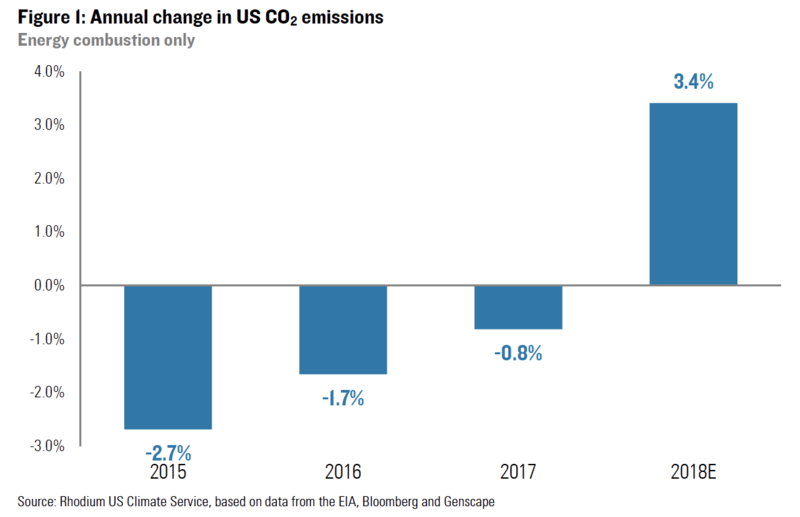 As the economy boomed, emissions rose sharply in 2018. Shipping was one source of the increase. "It appears based on preliminary data that emissions in the U.S. grew by the highest rate since 2010 when we were recovering from the great recession," says Trevor Houser, a partner at Rhodium and an author on the new estimate. Emissions rose roughly 3.4 percent in 2018, he says. Emissions were up for the first time since 2015. The big drivers were increased electricity demand and growth in trucking and aviation. The report underscores an unusual upside to an economic downturn: When the economy shrinks, greenhouse gas emissions also go down. That's what happened in the throes of the financial crisis in 2008 — carbon dioxide emissions plummeted. They've been bouncing up and down since then. But last year, the strong economic growth meant a rise. A cold winter was also a factor, particularly because it led to higher consumption of natural gas and fuel oil in homes for heat. There were some areas where decisions by government and industry helped to reduce some types of emissions. A record number of coal-fired power plants closed last year. And emissions from passenger automobiles dropped slightly, due to better fuel-economy standards. But it wasn't enough, and Houser wants more aggressive policies to drive drown CO2. That seems unlikely for now. Policies to limit greenhouse gas emissions started under the Obama administration are now being halted and even reversed under President Trump. "What we've seen is backsliding in federal policy, and we're starting to feel the effects of that now," Houser says. The report means the U.S. is less likely to meet its reduction targets under the global Paris climate agreement, according to Andrew Light, a senior fellow at the World Resources Institute. When the U.S. signed on to the agreement in 2015, then-President Obama promised a 26-28 percent reduction from 2005 levels by 2025. There's still time to catch up, Light says. "If we do get back on track in the United States toward having an energy policy that's consistent with the threat of climate change then we can turn these things around," he says. Stock markets have faltered in recent months, indicating the U.S. might be headed toward another recession. That could cause emissions to drop, but Houser says it would not be productive. "A short-term emissions decline as a result of a recession is not something anyone's cheering for," he says. "We do the best on this issue when the economy is thriving, and there are policies in place that can channel investment into clean energy technologies." After several years of decline, carbon dioxide emissions in the U.S. are on the rise. That's according to a new report out today. NPR's Geoff Brumfiel has more on what it could mean for the planet. GEOFF BRUMFIEL, BYLINE: Here's the upside of an economic downturn. Greenhouse gas emissions also go down. Factories are using less electricity. 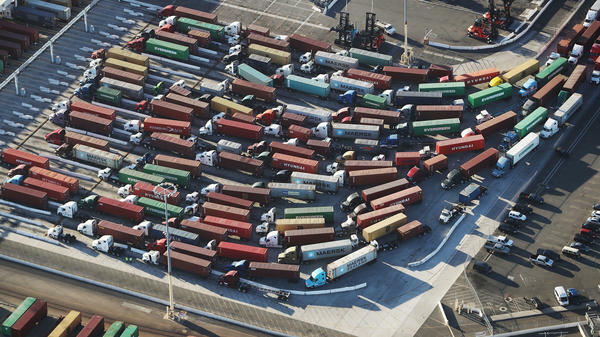 There are fewer trucks and planes shipping goods and people. And that's exactly what happened after the financial crisis of 2008. Carbon dioxide emissions plummeted. They've been bouncing up and down since then, but last year, the economy was on a roll. Output was up. And now an estimate by the Rhodium Group, an independent research firm, shows that CO2 emissions were way up. TREVOR HOUSER: It appears based on preliminary data that emissions in the U.S. grew by the highest rate since 2010 when we were recovering from the Great Recession. BRUMFIEL: Trevor Houser is an author on the new estimate. He says carbon dioxide emissions are up roughly 3.4 percent over last year. The big drivers were increases in electricity demand, which burns natural gas and coal, and big growth in trucking and aviation. BRUMFIEL: That come with a booming economy. Now, there were some areas where decisions by government and industry made a difference. A record number of coal-fired power plants closed in 2018, and emissions from passenger automobiles dropped slightly due to better fuel economy standards. But it was not enough, and Houser wants more aggressive policies to drive down CO2. That seems unlikely for now. Policies to limit greenhouse gas emissions started under the Obama administration are now being halted and even reversed under President Trump. HOUSER: What we've seen is backsliding in federal policy, and we're starting to feel the effects of that now. BRUMFIEL: So is Houser rooting for another recession to bring emissions down again? HOUSER: I (laughter) - I am not. I am not. Over the long term, short-term emissions decline as a result of a recession is not something anyone's cheering for. BRUMFIEL: What's needed, he says, is a strong economy and the right incentives to invest in green technologies. Geoff Brumfiel, NPR News. (SOUNDBITE OF MR TWIN SISTER'S "IN THE HOUSE OF YES") Transcript provided by NPR, Copyright NPR.